Extra-wide tripod feet provide a secure, stable platform. When you are not using your stands, conveniently fold and collapse the feet into a compact unit ready for transport or storage. The matte, red safety feet add a touch of visibility to these otherwise sleek stands to reduce the risk of tripping or toppling over in a dark room or venue. Grab the soft-grip, ergonomic twist clutch and easily adjust the height with a simple quarter-turn. The convenient shape and texture provide the perfect grip for the active user or if you are sharing the mic with a guest. 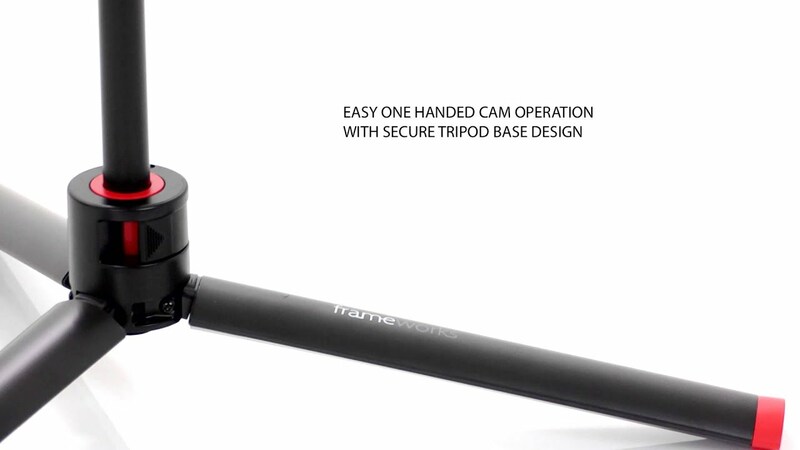 The easy close CAM levers on the patented telescoping boom arm allow you to quickly flip them open, slide the arm to the perfect length and snap down to lock it all in place. The patented telescoping boom arm expands up to 26″. Once the boom is set in place, a unique swivel grip allows you to rotate the microphone from the opposite end which is great for last minute adjustments when using an overhead microphone. The specialized cam lock at the base of the stand collapses the feet for easy breakdown and compact storage in a sleek, cylindrical design.